Ellen Rittgers has lived and painted on the North Shore for many years, and has studied with notable artists Robert Scott Jackson CM, and William Scott Jennings OPAM. 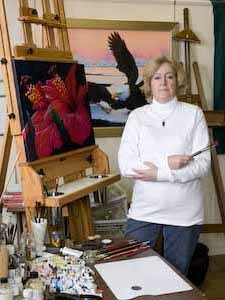 She holds membership in the Newburyport Art Association and Oil Painters of America, and has received numerous awards for her depictions of the landscapes and wildlife of New England. Ellen’s work is in many private collections both nationally and abroad.